For some time now I have shared glimpses of the wild neighbours that live side by side with me here in the densely forested Okanagan-Shuswap. Familiarising myself with these indigenous locals has been significant to settling myself into this land. Learning the ways and stories of this place that I call home: they have been, and continue to be my teachers. A little while ago I shared that I am pondering the addition of a new deck to work with alongside my favoured tarot from The Wild Unknown. As I have continued to roll this around, the idea of creating my own deck of animal wisdom using this catalogue as a basis unfolded. Kind of a pocket-sized version of the blog posts, if you will. When it came, the idea was simple enough: a deck of collaged images on index cards, combining indigenous wildlife photography with found text and other evocative clippings from a variety of magazines I have in my stash. I remember a long time ago reading Marian Green’s suggestions in A Witch Alone of how to go about making your own divination tools, such as pendulums, staves and runes, and how at the time I was enchanted by the idea of creating my own set of cards. Funny how we come full circle, or rather spiral back with expanded insight. All comes in good time. I guess some ideas just take a long time to cook. Like a really long time! I still have a long space to go in making all the cards I shall want, not least of all because I have presently run out of glue and would like to refresh my magazine stash; but the small collection I have begun this week I am really pleased with, and am enjoying the simple pursuit of snipping, clipping, gluing and sticking. But tell me, how do you feel about creating an oracle deck of your own? Is it something you would be interested in exploring? I would love to hear from you if you have your own handmade deck of sorts. How has it changed and influenced your cartomancy practice? If you enjoyed this post, please consider sharing it with friends using an option below. Thank you for your support. Ok Beka - you will HAVE to come in and do some art stuff with the class this coming year. What do you think? We can just call them "animal cards" and everyone picks their favourite animal and figures out what it is they can learn from that animal...I also love that footprint piece you did....I feel we must get your artistic influence into our classroom! Ms M. Absolutely! That would be fun. Maybe our indigenous culture representative could be involved too somehow? Sounds good! This is wonderful, totally you. I can't wait to see more of what you produce. I'm not even sure how I would even start with creating my own deck. I can already feel my brain asking questions like "how many cards make a deck?" " what images should i use?" ...but all that might change. As far as how many, I am going with a card for each of the animals I have shared here to start. Like you I don't know what final number to go with. Something to ponder... I guess what feels like you have enough variation or what feels symbolically appropriate. With imagery I am just pulling from the magazines I have for now - I too am always stuck as to what magazines to source from, but am working through that. Kind of go with what magazines I am drawn to on the shelf and going from there. It's very organic and goes through several stages. Sometimes I am just pulling images and words, sometimes I am compiling into collages. As for artistic ability, collage is amazingly forgiving. 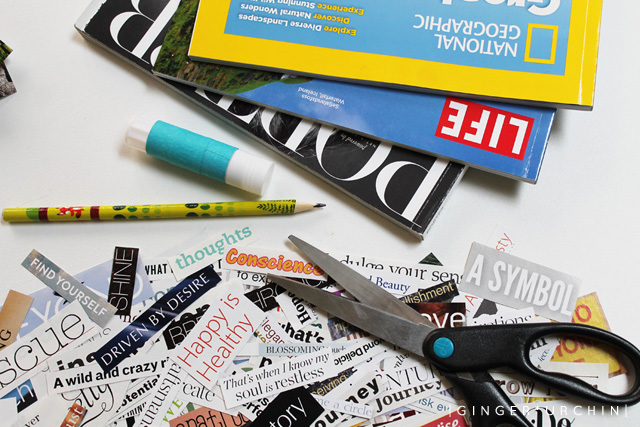 When you do get a few minutes browse Pinterest for collage, scrapbooking, and art journalling for inspiration. Really it comes down to what images you find + are drawn to and then composition of those elements.